The IoT_reaper botnet, discovered in October 2017, is expanding at a rapid rate. This botnet exploits vulnerabilities in IoT devices to drop the IoTroop malware. Millions of additional devices are being gathered and queued into the IoTroop C2 servers to have the malicious code injected that will join the devices to the botnet. KRACK, or Key Reinstallation Attack, leverages the 4-way handshake carried out within WPA2. It allows for Man-in-the-Middle (MiTM) attacks to be carried out and forces users on the protected network to reinstall an encryption key used for protecting WPA2 traffic, allowing attackers to capture sensitive information. DragonFly is considered to be a sophisticated and well-resourced group with a history of campaigns focused on cyber espionage against business computers and industrial control systems. Campaigns are carried out over an extended period of time while using infection vectors that are difficult to both detect and mitigate. Learn about the latest cyber threat trends from the first half of 2017 including the rise of leaked exploits, cybercrime trade, extortion and more. Read this report to learn more about DarkHotel including their motivation, common targets, tactics, techniques and procedures, IOCs and more. Learn about this sophisticated threat actor with strong ties to the NSA, including their motivation, target history and tactics and procedures. Learn about Axiom, a highly sophisticated and well-resourced threat group with strong links to Chinese intelligence. Learn about this threat campaign, which redirects victims to landing pages hosting a variety of exploit kits with the goal of stealing sensitive personal and banking information. Learn about the latest variant of Shamoon, including what it targets, its delivery methods and its effects, and gain best practice recommendations to mitigate cyber risk from Shamoon malware. Learn about RDP attacks, how they work, how cybercriminals are selling information stolen on the Dark Web and recommended courses of action. Learn how ransomware is evolving from encrypting data to disrupting business services and gain recommendations on how to protect your organization. Learn about the latest extortion campaigns and how to better defend against these types of threats. Learn how compromised credentials from older data breaches are used to establish trust and legitimacy in social engineering campaigns that led to new breaches. 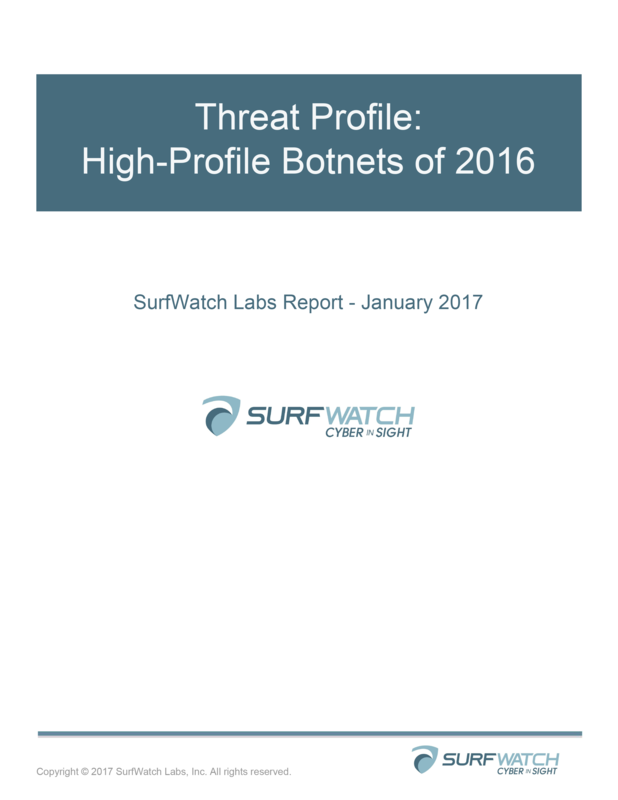 Learn about several of the most prominent botnets of 2016 and gain insights into how they work, along with tips from SurfWatch Labs analysts on how to mitigate the threat. Learn about the most impactful cyber threat trends our intelligence analysts observed over the course of the year and understand practical actions that can be taken to reduce your cyber risk. 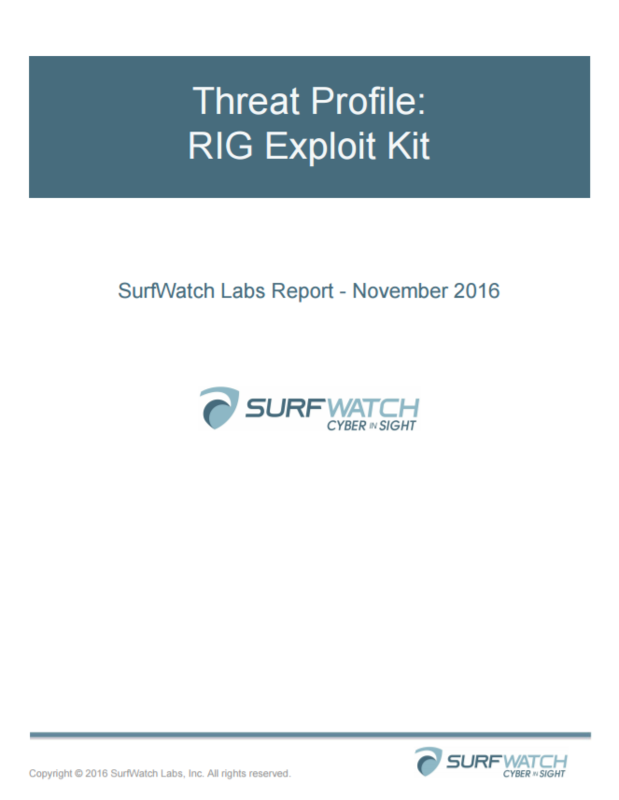 RIG is a weaponized malware kit designed to compromise a victim's system and deliver its payload. Learn how RIG works and the recommended course of action. Learn about the group claiming to be behind the DDoS attack on a DNS hosting provider, understand their tools, tactics and procedures and their motivations. Learn how Locky ransomware is delivered, what it targets, how it works and the steps you can take to protect your business from this malware. Learn about hacktivists, the impact their attacks are having on the government sector, and what steps can be taken to minimize threats driven by these malicious actors. Read this Actor Profile report on TheDarkOverlord, who has been associated with numerous data breaches. 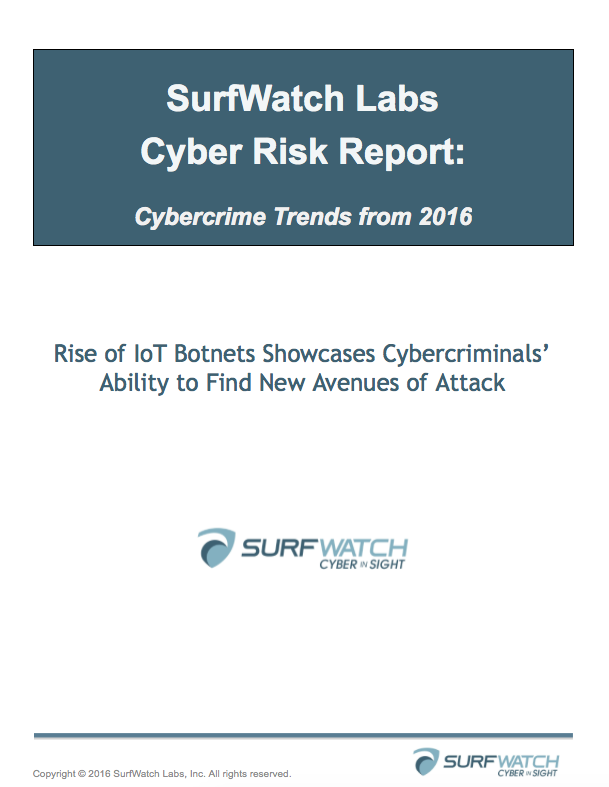 Learn about the latest cyber threat trends from the first half of 2016, including the top cybercrime targets, effects and practices. The Dark Web provides cybercriminals with a place to sell items and information with a high level of anonymity. 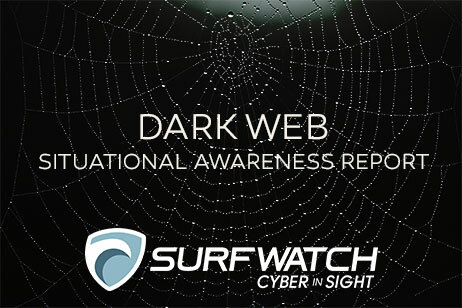 This report examines the impact of the Dark Web on an unnamed company's sensitive information and is a good example of what SurfWatch Labs can provide through its Dark Web Intelligence Service. 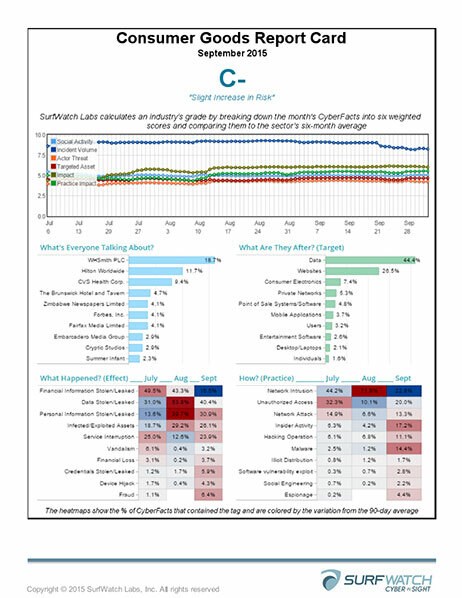 Quickly grasp the latest cybersecurity trends and potential impact to your business by reading this cyber risk report which includes insights and commentary from SurfWatch data analysts.